The air filters in your HVAC system are mean to keep your air conditioning and heating system running clean, and your furnace firing on all cylinders. They do not do so, however, completely autonomously. Air filters must be changed to ensure the efficiency of your system and the quality of your air. Should fail to do so, you may start to see the energy costs associated with running your home’s HVAC system climb as the forced air works hard to push through those blocked filters. More importantly, and scarier than rising costs (if you can imagine that) is what is blocking that forced air. Mold and bacteria that is carried on forced air and stopped by the air filter can fester and spread throughout the duct work and into other areas of the house if filters are not replaced regularly. In this article we outline everything you need to know about air filters to keep your heating and cooling system from becoming a hotbed for germs. If you use your air conditioner or heat on a daily basis, as you might in the summer or winter months, it is a good idea to check your filter’s once per month. 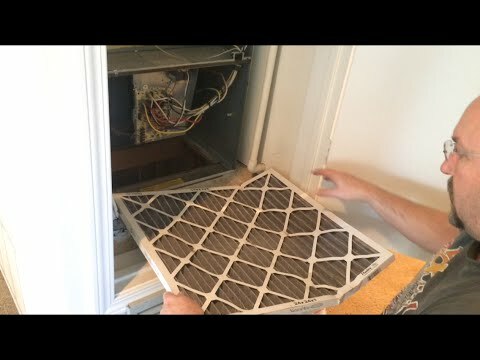 This will allow you to see any buildup in progress, rather than pulling out a completely compromised filter that hasn’t been check in close to a year. If you do not use your unit that frequently, as might be the case if your home is located in a region of the country that keep comfortable temperatures year round, you may not have to check as often. This does not mean you can ignore filters completely. If your house is home to pets, smokers, or a lot of people your filters should still be monitored monthly. Filters that are non-pleated, or smooth instead of ridged, have less surface area on which particles are filtered. This means they will gunk up much faster than pleated ones and stop working as efficiently as possible faster. That said, non-pleated filters generally have lower energy costs, but this fact seems offset by the fact that they require such frequent change. When in frequent use, as in the summer or winter, regardless of what filters look like, they should be changed every three months. Use this time frame as a rule of thumb for the maximum length of time you can go without changing. 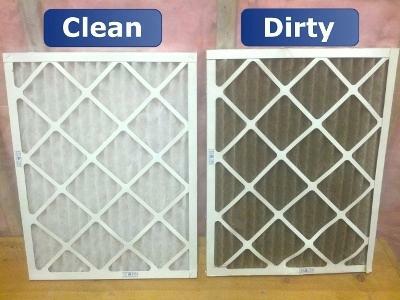 Certainly, though, you should change filters earlier if they appear dirty. This is why we check every month at minimum. No matter when it was last changed, if upon your monthly check your filter appears to be dirty, damp, moldy, or severely discolored, you should absolutely change it out immediately. The right filter for your HVAC system is dependent on the type of system it is. If you were the home’s owner when the system was originally put in, then you likely have a good sense of what kind of filters should be used. If not, you may want to do a little research or at very least ask your HVAC technician when you call for regular servicing. For air conditioning units that sit in the window or cut out of a wall, air filters still need to be monitored and changed with the same regularity as would take place with forced air, central systems. The type of air filter needed for these units are typically easier to nail down as it will likely correspond with the brand and model number and be made easily available at any hardware or home improvement store. There are also considerations that need to be made with regards to sizing. Independent units will have a label somewhere on the unit that describes what size filter is needed. Common sizes for air filters are 16 by 20 inches, 16 by 25 inches, and 20 by 25 inches. If you are still struggling to find out the exact type and specifications of the proper filter for your system, your best bet is to snap a photo and take it to down to the store with you or take the filter itself. Ultimately, you cannot match by eye but are instead looking to match a model number or label. 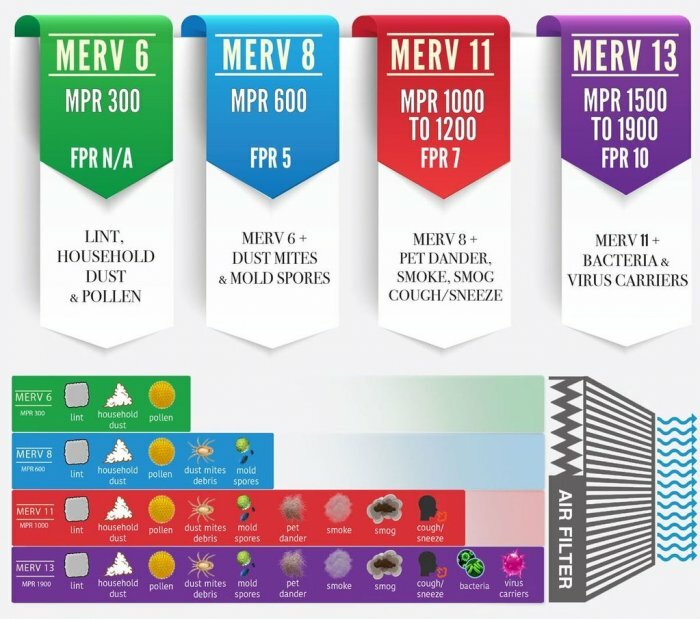 The best filters are qualified by a MERV rating of 6. MERV stands for Minimum Efficiency Reporting Value. This is a measure of how well the filter catches small particles. The more particles it catches, though, the more energy the filter must use, thus higher MERV rated filters will cost your system a bit more. A MERV rating of 6 is somewhere in the middle of high filtering and low energy costs, so it tends to be a good median number to settle on. Of course, the MERV rating of your filters are your choice and should be chosen based on what is important to you as the homeowner. For instance, if you are concerned about air quality than you will want to spend the money on a filter with a higher MERV rating. This might be the case if there is someone living in your home with asthma, allergies, or other respiratory illnesses. If yours is a central heating and cooling system, then you will replace the filter at the main unit that controls circulation and conditioning or the air. Most of the time, these main units are in the basement or somewhere out of the way of the main living space within the home. If you genuinely do not know where yours is, you can find it easily by following duct work to the controlling unit. On the HVAC unit, there will be an air filter slot located somewhere between the two large metal boxes that comprise the whole of the unit. These boxes are the air handler and the plenum, respectively. If you cannot find the filter on the main unit, try looking at the forced air vents in individual rooms. On some units, each vent has a separate filter behind the grate. On a window unit, the filter slot will come out right behind the grill of the unit, usually on one side. Once you have found the filters, turn your unit off. This way, while the filters are removed, no particles are blowing into the home. Next remove the old filters. Be careful when you do. If they are significantly dirty, pulling them out quickly could create a messin your home of all the stuff you were trying to filter out in the first place. Throw the old filter in the trash right away and seal the bag. Take your new filter and slide it into the filter slot to mimic the orientation of the old filter. The filter should fit into place without resistance. If it is difficult to push it in, there is either something jamming the slot or the filter is facing the wrong way. Once the new filter is in place, check for any gaps or signs that the filter is not the right fit. If the new filters you purchased prove to be too small, put the old filters back in temporarily until you find the right size. With the new filter properly fitting, fire the main unit back on and ensure air is flowing correctly. Make sure to mark the last filter change date somewhere near the main unit so you have a running record of this maintenance. This will also help HVAC technicians who come to service your system later on.